Photographed on the Sunday 09 August 2015. All flies belong to the Class Insecta, Order Diptera, this Migrant Hoverfly (Eupeodes corollae) is from the Family Syrphidae, Tribe Syrphini and Genus Eupeodes and appears to be a female (possibly). Members of this genus are among the commonest of the Syrphini. These hoverflies can be abundant in late summer and early autumn and numbers can be boosted by migrants. E corollae and E luniger larvae are both predacious on ground-layer aphids, whilst the majority of Eupeodes feed on coniferous aphids. The male and female of this species can be difficult to determine with the males having squarer commas on tergites 3 & 4. This hoverfly is one of our most common in open land though not so common in Ireland. They have a Palaearctic distribution. These hoverflies along with others have been used to trial biological control of pests in the case of E corollae it was found that they also had a liking for fruit so not so good where fruit grew under glass. 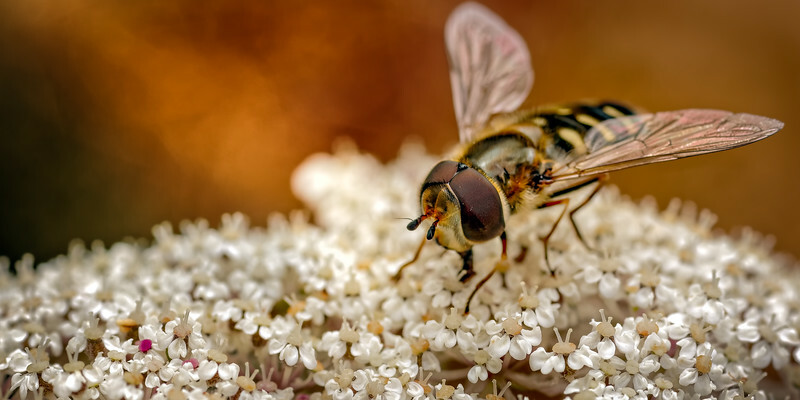 However, one farmer in Tasmania had a roaring success from a hoverfly (Melangyna viridiceps) that had migrated there yielding bumper crops as the new migrant helped to reduce the pests such as aphids whilst also pollinating the flowers. So hoverflies may well be playing an important part in our gardens and agricultural/horticultural crops.